Female green frog at the edge of my pond, July 1998. To see a male, click here. These animals are mostly species found near Maryland (native and introduced) but many have wide ranges all over the continent and even the world. The African clawed frogs and African dwarf frogs are two exceptions that were added for the benefit of interested aquarists. What do Amphibians Provide for a Pond? Where Can I Buy Some Frogs and/or Salamanders? Why Did My Fish Die After The Toads Laid Eggs? Will My Pond Be Overrun With Toads? Where Can I Buy Some Salamanders? 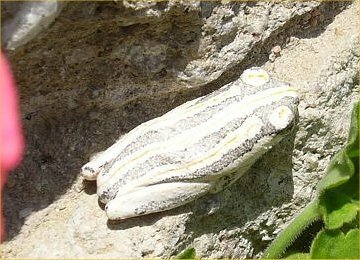 To see photos of the frogs and toads that have visited us, go to my pond amphibian pictures page. There is a section on keeping animals (including tadpoles and frogs) from getting sucked into pond pumps here. 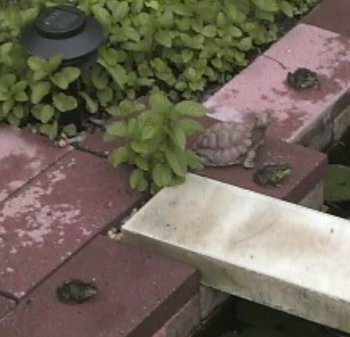 One way to help frogs and toads breed if you have no ponds or a pond with fish that eat the eggs and tadpoles is to set up fish-less container ponds. See my tub pond page for more information. If you have eggs in your pond and are not sure what they are, check out the pond egg identification guide. 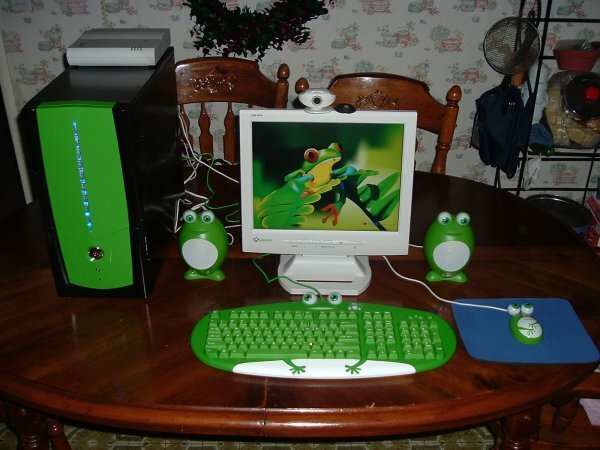 Keith created a frog computer system for Sandra and sent this photo of it to me on 1/21/06. 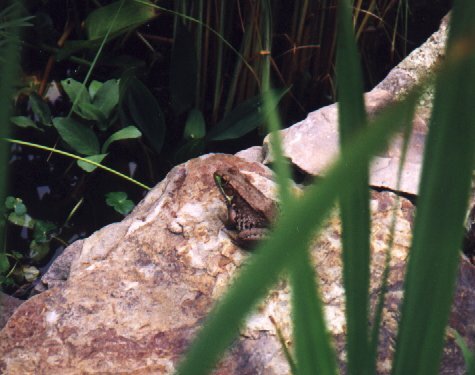 Three green frogs having a meeting around my 153 gallon pond on 6/3/01. 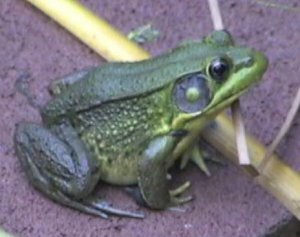 On 10/25/07, Willie sent me this photo of a pretty frog found in Namibia, Africa. I do not have a clue what it is but put the photo here since it is a unique frog. It is gray with yellow and white stripes. 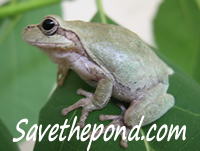 Vote for this site as a Top Frogs, Toads, & Critters site below. Below are The Hopping Frog Webring, the Lily Pad's Frog Lover Web Ring, and the Froggie Lovers' Web Ring.